They can’t all be winners. With their long seasons, it’s common for TV shows to sag a bit in the middle, and The Larry Sanders Show wasn’t immune. HBO’s comedy series these days usually top out around 10 episodes or fewer each season, but back in the heyday in the mid-’90s, The Larry Sanders Show was doing 17 episodes a season (18 in season two). Eastbound & Down, for instance, only had six episodes its first season and maxed out at eight. “Headwriter” should be a great episode. Wallace Langham’s Phil character is an important part of the Larry Sanders ensemble, and giving this “snide little prick”—Artie’s words—the headwriter job should make for an excellent episode. Also helping: It was written by the late Drake Sather, who wrote “Larry’s Agent” and “Performance Artist,” among others. It’s not great, though. It’s not bad at all, either. Any episode with that much of Artie dressing down subordinates can’t be bad. But it just kind of…is. 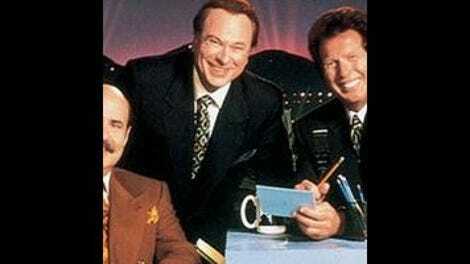 Larry Sanders was a famously cheap show, what with its paper cutout computer screens and DPs on Rollerblades, and “Headwriter” accidentally draws attention to it when it comes to the cast. The show’s former head writer, Jerry (Jeremy Piven) left toward the middle of season two, but his character was never recast. In “Headwriter,” Artie provides a key bit of exposition by saying they haven’t been able to keep a head writer for more than a month since Jerry left, but we haven’t seen any of these people. Mike (John Riggi) is brought on in “Larry’s Birthday”—sealing Jerry’s exit—but he only shows up in two other episodes in season two, and this is his only season three appearance. Odder is the sudden appearance of another writer Greg (Jim Turner), who wins the Mindy Sterling Memorial Oh I Guess That Person’s A Writer? Award, as he’s never seen or heard from again for the rest of Larry Sanders’ run. There really isn’t another regular presence in the writers’ room until season five, when Sarah Silverman joins the cast. The point of all this is that it feels like it’s trying to create a story where none exists. To viewers of the show, Phil is the head writer. Who else would it be? The Larry Sanders Show had a habit of this over its six-season run, like how Janeane Garofalo would disappear for long stretches. Season two’s “Performance Artist” is devoted to the problem of getting better people booked on the show, but Paula’s not present. Suddenly’s there’s a booker named Kiki (Maureen Mueller), who would only appear on one other episode. “Headwriter” also has a B-story that goes nowhere, as Hank learns from a detective that workers from the Lookaround are dealing drugs out of the restaurant. It leads to a couple funny scenes—Darlene freaking out, and Hank pre-confessing to obtaining a handicapped parking pass through shady methods before the detective even says a word. Some funny exchanges follow as Larry, Hank, and Artie discuss it while shooting promotional photos, but it’s never mentioned again. “I’m a people person,” Phil protests. When Phil tries to force Artie into demoting him by making a list of ridiculous demands (full creative control of comedy pieces, double his current prop budget, Paula’s termination), the old pro sees right through it—and doesn’t give in. Artie’s crafty instincts guide “Like No Business I Know,” when Hank encounters a rare job offer: Regis Philbin is leaving his wildly popular morning show to do a late-night talk show—his demographics are better than Leno, Letterman, or “any of these young punks.” Philbin genuinely seems to like and respect Hank (unlike his current employers), so it’s a little surprising that he doesn’t even consider it. Maybe it’s loyalty to Larry, or maybe it’s something else. Does he know that? Of course he does. He knows Hank has no chance at snagging Philbin’s spot on Live With Regis And Kathy Lee, and he likely knows something else that Hank doesn’t: Philbin’s late-night show isn’t debuting until his contract with Live expires in not-so-immediate future of 1997. And even if Hank weren’t trapped, would losing him from the show be all that bad? It’s win-win. Never cross the puppet master, people. Or his plants. In another “ripped from the headlines” story on The Larry Sanders Show, Bobcat Goldthwait is a guest on the show, not long after an infamous appearance on The Tonight Show where he set Leno’s couch on fire. It’s not mentioned in this episode, but he’d also tossed furniture on Conan’s Late Night set in 1993 and had generally been a live-wire on late-night shows. Larry, always desperate for some attention, brings him on the show, and Artie gets protective. In a great moment, he deftly switches from glad-handing to warning Goldthwait: “I just love your clown movie. I’m just a sucker for drunk clowns. Now listen up, junior…” The fabric on the chair is no longer being manufactured, and those LARRY letters are pricier than they look. Nevertheless, the Goldthwait segment goes predictably haywire (with Larry and Artie ostensibly shocked and appalled). The theme of “Headwriter” continues through “Like No Business I Know,” as Larry tells Artie to “deal with” the Hank situation—he doesn’t want to know the details. So he doesn’t know that Hank quit (leading to that great “You are cold, baby” from Hank before the show), yet plays the whole situation off as if he knew. When Hank confesses that his marriage is failing and his life is a wreck, Larry gets to play the magnanimous one and let him stay on. Little does he know that Artie had the whole thing under control the entire time. But Hank’s marriage isn’t long for this world—it’s too bad for him, but great news for Larry Sanders Show fans, as we have some great stuff coming up. Goldthwait’s “clown movie” is the 1991 cult film Shakes The Clown. Although Regis Philbin got his start in late-night TV, I can’t find any indication that he was in the running for any of the late-night gigs in the ’90s. He was riding high with Kathy Lee in those days. That exchange where Artie explains to Larry about how the elephant palm comes from a seed/nut is The Larry Sanders Show at its low-key finest. The deleted scene from this episode is a longer version of it, and Garry Shandling has to turn around because he’s laughing at the end of it. Also great: the looks on Artie and Larry’s faces as they quietly discuss Hank in the hallway. I love Sid, Hank’s ancient agent. How ancient? He refers to aged Regis Philbin as “a good kid.” Phil Leeds, who played Sid, acted right up to his death in 1998. Why does Kathy Lee hate Hank? He locked her in a Camaro’s trunk at the 1979 auto show in Buffalo.